The Filter Fiber Stuff combines high performance, outstanding value, and environmentally friendly features into one great product. When used as a safe alternative to DE in DE filters, The Filter Fiber Stuff requires less than half the amount of product (by weight) than needed when using DE. It can be used to enhance the filtering performance of sand and cartridge filters as well. 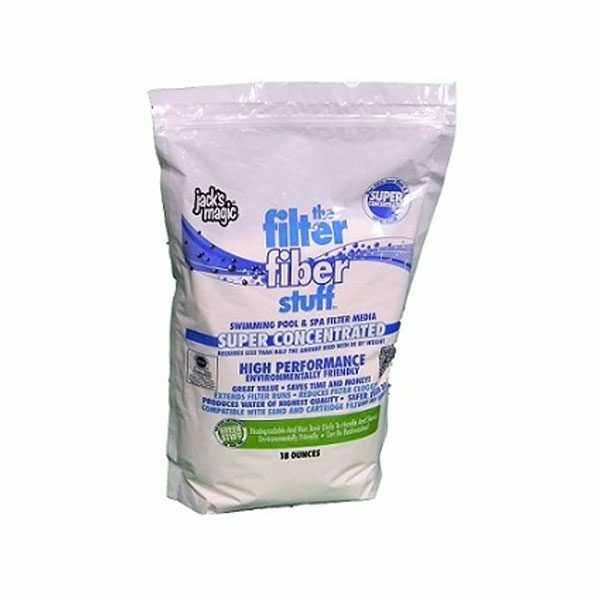 The Filter Fiber Stuff is non-toxic, making it safe to handle and store. It can also be backwashed safely as it is biodegradable. The Filter Fiber Stuff extends filter runs, reduces filter clogging, and results in sparkling clear water of the highest quality. (Please Note: The first few filter runs may actually be shorter, due to the filtration of much finer particles). The Filter Fiber Stuff is also WQA (Water Quality Association) certified and has met the requirements of NSF/ANSI-50 for swimming pools and spas/hot tubs. Please backwash and/or dispose of the Filter Fiber Stuff in accordance with your local or state regulations.